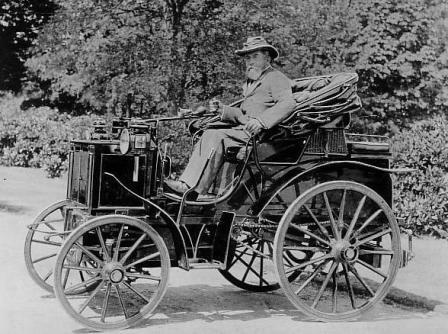 The Honourable Evelyn Ellis (1843-1913), an inveterate traveller whose background had been at the Embassy in Brussels, was interested in the developing motor industry in France and Germany in the 1890s and became a pioneer in promoting it over here. A considerable hindrance to its progress was the legal requirement for a man with a red flag to walk in front of any self-propelled vehicle on a public road at no more than 4mph. This Act was designed to slow down steam traction engines (called light locomotives) as they and the machines they powered were moved between farms. Ellis deliberately intended to flout this law to expose its absurdity and hasten its repeal so that English motor manufacturers, and those (like himself) ready to invest in them, would be able to compete with firms such as Daimler and Peugeot across the channel. 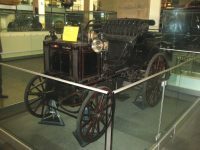 In June 1895 he ordered a left-hand drive motor car to be made to his own specifications from the Paris firm of Panhard-Levassour, powered by a Daimler engine. It was taken across the channel and on by train to Micheldever station in Hampshire, from where he drove it up to Datchet on 5th July. 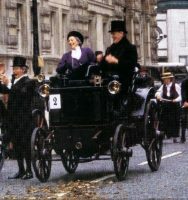 He was never actually stopped by the police but the Act was repealed in 1896 and celebrated by the first Motor Car Tour to Brighton, or the ‘Brighton Run’, when the speed limit was raised from four to twelve miles an hour. Ellis became one of the first directors of the original Daimler Motor Company in Coventry and was one of the founders and vice chairman of the RAC. We set forth at exactly 9.26 am and made good progress on the well-made old London coaching road; it was delightful travelling on that fine summer morning. We were not without anxiety as to how the horses we might meet would behave towards their new rivals, but they took it very well and out of 133 horses we passed only two little ponies did not seem to appreciate the innovation. On our way we passed a great many vehicles of of all kinds (ie horse-drawn), as well as cyclists. It was a very pleasing sensation to go along the delightful roads towards Virginia Water at speeds varying from three to twenty miles per hour, and our iron horse behaved splendidly. There we took our luncheon and fed our engine with a little oil. Going down the steep hill leading to Windsor we passed through Datchet and arrived right in front of the entrance hall of Mr Ellis’s house at Datchet at 5.40, thus completing our most enjoyable journey of 56 miles, the first ever made by a petroleum motor carriage in this country in 5 hours 32 minutes, exclusive of stoppages and at an average speed of 9.84 mph. In every place we passed through we were not unnaturally the objects of a great deal of curiosity. Whole villages turned out to behold, open mouthed, the new marvel of locomotion. The departure of coaches was delayed to enable their passengers to have a look at our horseless vehicle, while cyclists would stop to gaze enviously at us as we surmounted with ease some long hill. Mr Ellis’s motor carriage is a neat and compact four-wheeled dog-cart with accommodation for four persons and two portmanteaus. The consumption of petroleum is little over a halfpenny per mile and there is no smoke, heat or smell, the carriage running smoothly and without any vibration. If anyone cares to run over to Datchet they will see the Hon. 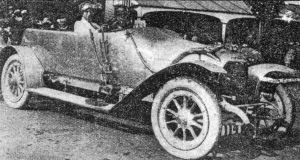 Evelyn Ellis of ‘Rosenau’ careering around the roads, up hill and down dale, and without danger to life and limb, in his new motor carriage which he brought over a short time ago from Paris where they are in pretty frequent use. Can it be easily driven? 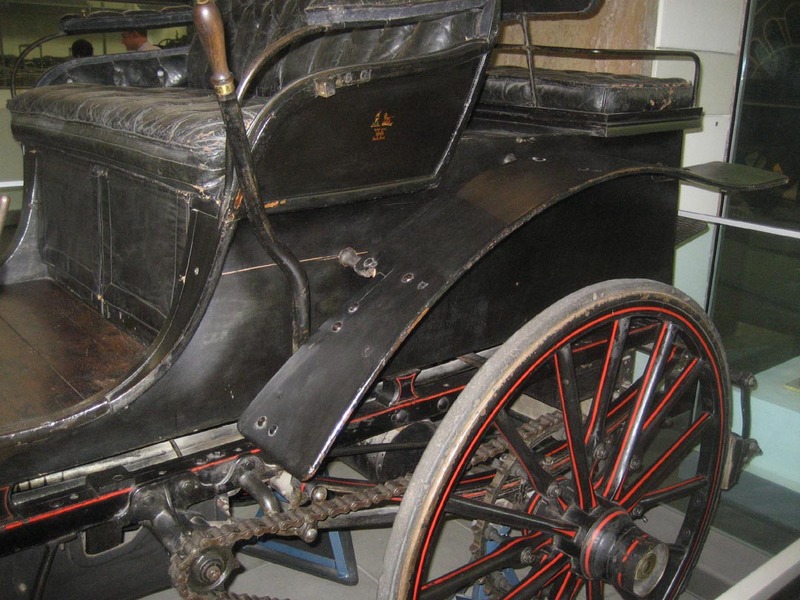 We cannot say that such a vehicle would be suitable for a lady, unless rubber-tyred wheels and other improvements are made to the carriage, for a firm grip of the steering-handle and a keen eye are necessary for its safe guidance. But for gentlemen they would be invaluable, especially if they were used, as they are on the Continent, by doctors and commercial travellers. Is there fear of accident? It need not be apprehended that this new vehicle, if it becomes popular, will cause any dangerous alarm to horses. Already accustomed to the incidents and surprises of everyday street traffic they would soon become as indifferent to to horseless carriages, silent and unobtrusive, as they already are to bicycles. What is its cost? Such a one as that owned by the Hon Evelyn Ellis would cost £200, and for long journeys its maintenance would be from ten pence to a shilling an hour. It is a splendid hill climber and climbs at a faster pace than a pedestrian can walk. A trip from ‘Rosenau’ to Old Windsor, up Priest Hill and descending the steep, rough and dangerous hill on the opposite side, past the workhouse and through Old Windsor back to ‘Rosenau’ within an hour demonstrates how perfectly under control this carriage is, while the sensation of being whirled rapidly along is decidedly pleasing. Ellis’s riverside house on the Thames was burnt down in the 1930s and the property now known as ‘Woolacombe’ was built on its site in Southlea Road. This is a private house and there is no access to its riverside site. There was a house on this site at least by 1780, and probably from long before that. Evelyn Ellis married in 1882 and came to live here soon afterwards. 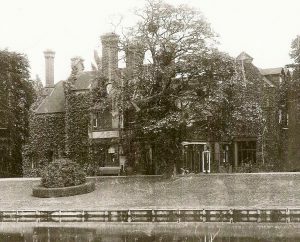 He may have had the house built for himself, but it was undergoing repair in 1871 and was then occupied by Thomas E Howe, a barrister, with his wife, six children and many servants until 1881. 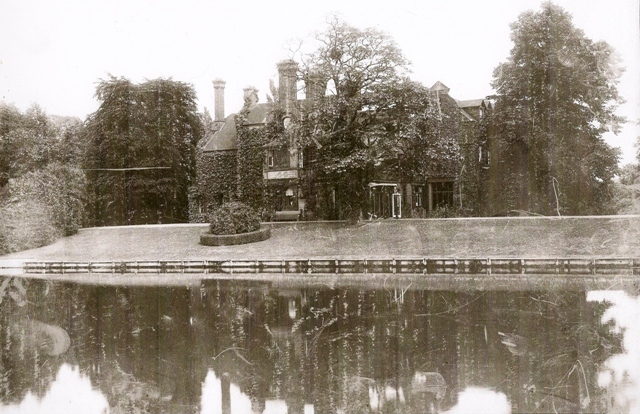 So the house in the photos is more likely to have been built by Howe. From the late 1880s Ellis had been experimenting with novel ways of powering his launches on the river, using steam generated by naphtha and Daimler petrol engines. 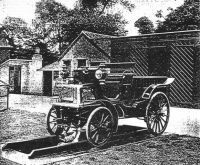 The original Panhard motor continued its life as a station car (ie for collecting visitors), and its engine was also used to power a pump for watering the lawns and in case of fire, said to have been used for demonstrations by the village fire brigade. The stables at Rosenau were converted to the first set of ‘garages’ in the country (and probably the first use of the word) complete with a sunken inspection pit. There were at least six motor tricycles alongside the other motor vehicles. 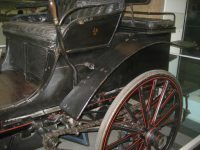 One of Ellis’s great feats of motoring was his 1897 climb, in a specially built Daimler, of the Malvern Beacon which included gradients of 1 in 4½ over rough tracks. The two photographs taken at the top of the Beacon (left, below) show his nine year old daughter Mary beside him. 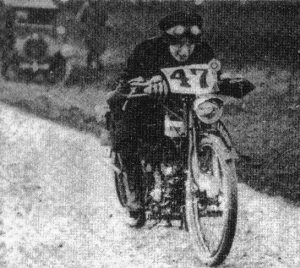 She grew up at Rosenau with an adventurous taste for motorbike racing, joining forces with her cousin Christobel who owned a GWK cycle car (GWKs were made at Datchet 1911-1914), and designing leather biking gear to wear. 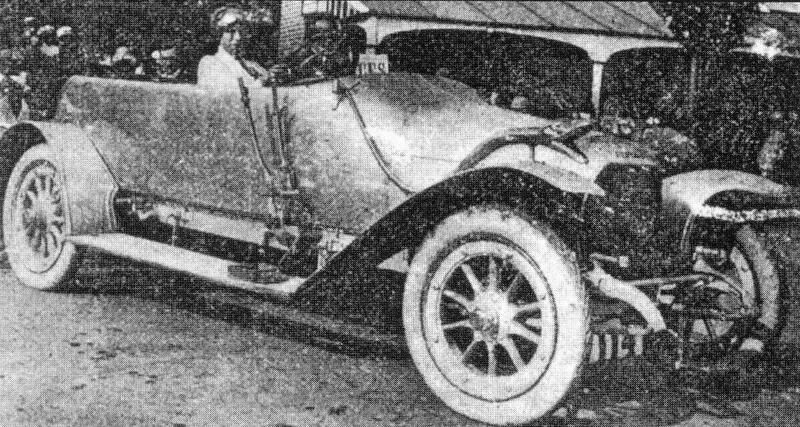 After her father’s death in 1913 Mary bought a Spyker racing car which she used in time trials at Brooklands, though she gave up competition driving after she married; she met her husband after his horse had shied at the sight of her car. The second two photos below show Mary on a racing bike and in her Spyker. Evelyn Ellis deliberately encouraged other people to take an interest in his activities, and was certainly very influential. In February 1896 he gave H.R.H. 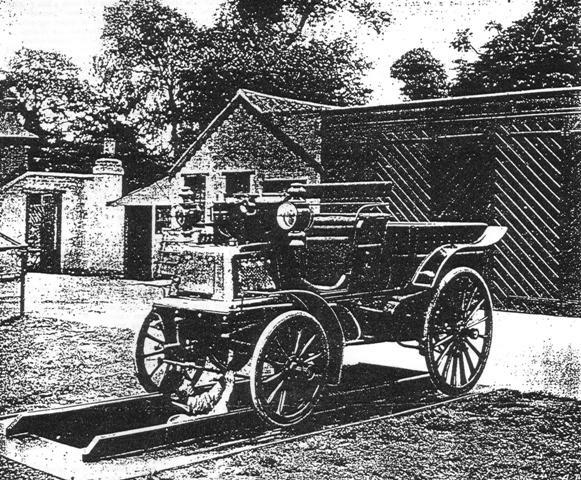 the Prince of Wales (afterwards Edward VII) his first drive in a car and it is likely that John Douglas Scott-Montagu, the founder of Beaulieu Motor Museum, would have been aware of Ellis’s activities at Rosenau since his family owned Ditton Park in Datchet. Ellis’s original vehicle was given to the Science Museum in 1910 by the RAC. In 1996 the Veteran Car Club of Great Britain organised a Centenary Brighton Run, at which the Panhard-Levassour made a guest appearance as a static display. The photo (left) shows Ellis’s grandaughter Miss Denise Critchley-Salmonson (daughter of Mary Ellis) with Neil Cossons, Director of the Science Museum.